Looking for a Used QX70 in your area? CarGurus has 808 nationwide QX70 listings starting at $14,995. After standing pat on its sporty QX70 for the current model year, Infinity has mildly upgraded this handsome compact luxury crossover for 2017. Though the 5-passenger, 5-door QX70 remains long on looks, performance, and handling, it still comes up a bit short on utility and ride comfort compared to many rivals in this expending market, according to most in the media. Despite this, the QX70 is a solid choice if you’re looking for some driving panache in your commute or a plush ride to the theater. Expect the 2017 QX70 to return in the Base (with standard rear-wheel drive) and Base AWD (full-time all-wheel-drive) trims, with a new premium-level Limited (and Limited AWD) trim that mirrors the Japanese automaker’s QX80 Limited, which debuted in 2016. The folks at Infiniti claim the brand-new QX70 Limited will give this luxury mini-ute a boost in exclusivity with its enhanced styling and comfort features--but the Limited's performance will be similar to that of the Base. The 2017 QX70 will also feature the new mesh grille that’s slated to be introduced across the Infiniti lineup. Although the 2017 QX70 is slated to retain its sleek profile, the sloping roofline again limits rear-seat headroom and cargo space, which remains 62 cubic feet with the rear seatbacks folded. 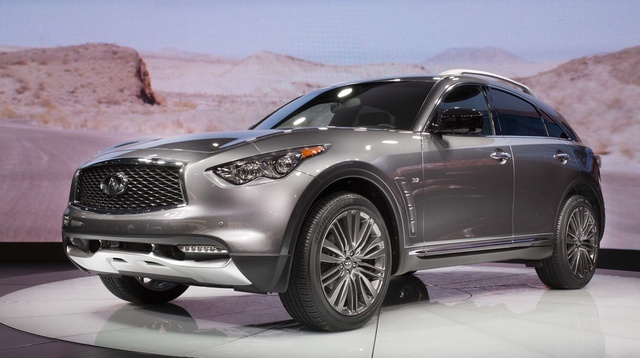 Look for the 2017 QX70 stable to tote a 3.7-liter normally aspirated V6 that puts out 325 hp and 267 lb-ft of torque. A 7-speed shiftable automatic transmission and a sport-tuned suspension also return standard. Expect mileage figures in the RWD QX70 versions to mirror 2016’s 17 mpg city/24 highway/19 combined, with the AWD variants again estimated at 16/22/18. Exterior adornments on the 2017 QX70 Base trims are slated to include 18-inch alloy wheels, a power sunroof, heated power-folding mirrors, and a power liftgate, with the new Limited trim anticipated to add standard 21-inch aluminum wheels, as well as unique badges and styling cues. Inside, look for the QX70 Base to return sporting standard leather upholstery, heated power-adjustable front seats, full power accessories, cruise control, telescoping tilt-wheel steering, a remote garage door opener, dual-zone automatic climate control, a rear-view camera, and an auto-dimming rear-view mirror. Meanwhile, the new Limited is expected to add ventilated front seats, genuine wood cabin accents, and aluminum pedals. Expect techno-goodies and entertainment features in both the Base and the new Limited QX70 to include Bluetooth hands-free calling and a 7-inch touchscreen display for the upcoming year, along with a CD player hosting 11 Bose premium speakers, satellite radio, two USB ports, and an auxiliary audio input. The QX70 Limited is also scheduled to come with a number of standard features that are presently listed as options aboard the Base trims. Additional optional equipment available on both the Base and Limited includes aluminum roof rails, memory for driver settings, a power-adjustable steering wheel, GPS navigation with an 8-inch display, an around-view camera system, front and rear parking sensors, and Bluetooth audio streaming. Standard safety equipment aboard the QX70 for 2017 is scheduled to include 4-wheel antilock brakes (ABS), traction and stability control, front side-mounted airbags, front and rear head curtain airbags, daytime running lights, turn-signal-integrated mirrors, front fog/driving lights (LED fog lights on the Limited), and a remote antitheft alarm. The optional Technology package includes additional safety equipment like adaptive high-intensity-discharge (HID) headlights, adaptive cruise control, lane-keeping assistance, and forward collision warning with an automatic braking feature. Government crash-test data is unavailable for the current QX70, but the Insurance Institute for Highway Safety (IIHS) gave the crossover its highest overall score of Good for 2016. Look for Infiniti’s 2017 QX70 to go on sale in late summer 2016, with challengers expected to include BMW’s X3 and Porsche’s Macan, both of which offer more interior room than the Infiniti. The Acura MDX and Volvo XC90 both pack an additional row of seating, while Mercedes-Benz’s GLE Coupe offers high-end Euro-styling and comfort. What's your take on the 2017 INFINITI QX70? GuruDH52Z The interior is very, very cramped. Definitely not a family car. More like a sports car. Users ranked 2017 INFINITI QX70 against other cars which they drove/owned. Each ranking was based on 9 categories. Here is the summary of top rankings. Have you driven a 2017 INFINITI QX70?